PhotoSpring is the modern day solution for displaying, keeping, and organizing your digital photos and videos. Designed in a single, elegant device PhotoSpring is both a digital photo frame and a digital photo album. --- As a digital photo frame, PhotoSpring displays all your beautiful and memorable photos in plain view. As a digital photo album, PhotoSpring stores and organizes a lifetime of photos for you. --- PhotoSpring provides easy to use tools to help gather all the photos and videos you have scattered across your many devices. These tools are helper Apps that are available for iPhone, Android, Mac and Windows computers. --- Sharing photos with family and friends becomes so easy with PhotoSpring. Send photos directly to PhotoSpring from any Smartphone with the PhotoSpring App. Your photos will automatically be displayed on PhotoSpring. 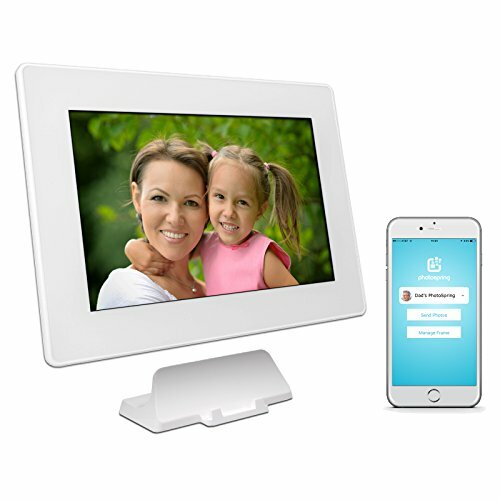 Mom and Dad won’t have to lift a finger to see the photos you share with them. --- With PhotoSpring in your kitchen or living room, you’ll see a different set of photos every day and throughout the day. Some may be from as recent as yesterday, others might be long forgotten memories from years ago, regardless, PhotoSpring will keep you smiling throughout the day. -- PhotoSpring is easy to setup and easy to use. The large bright screen will show your photos in vivid color and be clearly visible from any angle. The touchscreen control and rechargeable battery, make it easy for you to pick up PhotoSpring out of its charging stand to view your photos on the sofa or bring out with you when meeting friends. You can take a leisurely stroll down memory lane by browsing through your entire photo collection. Or, if there is a specific photo that you want to find, use the filters to help find what you want in a snap. --- With PhotoSpring in your life, you’ll develop a whole new sense of appreciation of your photos and finally see them as often as you should. If you have any questions about this product by PhotoSpring, contact us by completing and submitting the form below. If you are looking for a specif part number, please include it with your message.